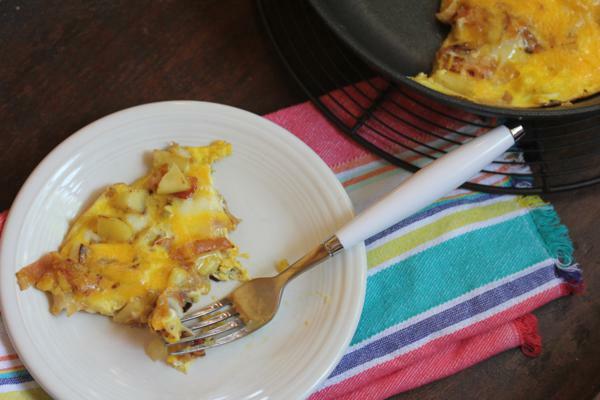 Apples, bacon, cheese, and eggs combined together in one delicious quick and easy meal! This might be one of my new favorite quick and easy meals. It is also gluten free which is a nice bonus. My family at first thought the apples added to it was a bit strange, but we ended up loving it. Bacon, cheese, and eggs always go well together. The apple added in is perfect for fall. Cheese and apples together might seem like a bit of an odd combination for some, but it is actually a combination that has been around for years. My dad always eats a slice of cheddar cheese with his apple pie. I think the combination of the apples and cheese is a bit of an old fashioned type thing. Or maybe it is a regional thing. I am not sure. I do know that my dad and others ate cheese with their apple desserts often. When I was a kid I always thought it was strange. Why would anyone want cheese with their apple dessert? But now I love the combination of apples and cheese together. There are a lot of cheeses that go well with apples, but my favorite is a sharp cheddar. The sharpness pairs really well with the sweetness of the apples. And if you don’t have any bacon sausage works well also. 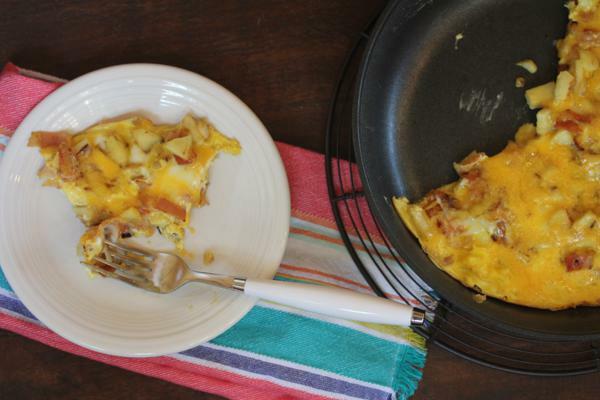 Bacon, cheese, eggs, and apples combined to make a simple breakfast, lunch, or dinner. Crack eggs into a small bowl and whisk until well combined. Set aside. In a non stick pan or skillet, cook bacon until done. Remove from pan. Drain part of the grease off leaving about 2 tablespoons in the pan. Cook onions and apples in the bacon grease until onion and apples are starting to soften and onions are slightly browned. Add bacon back to pan. Stir to combine. 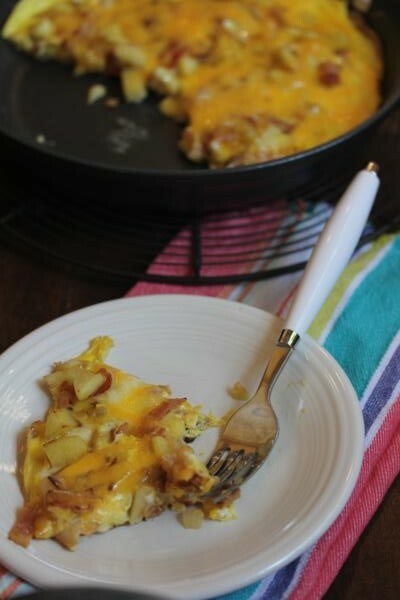 Pour eggs over bacon apple mixture and sprinkle with cheese. Cook on low until eggs are set and done. You can cover this to help it cook more evenly. Or place it under the broiler for the last few minutes to brown up the top. Just be sure your pan is broiler safe and that you watch it carefully. I find that cooking it low and slow on the stove top is best though is best. A hug without a squeeze!